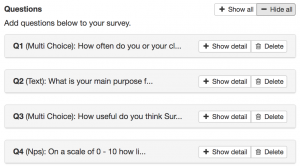 You can now get an email alert whenever someone responds to your survey. The email contains all the questions and answers for the response. 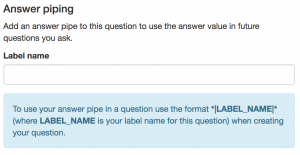 Use merge fields in your questions and messages to include respondent names and other fields. 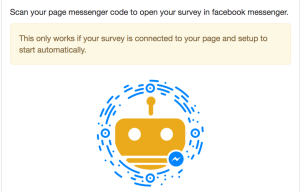 If you have an auto start survey you can get respondents to use your messenger code to initiate the survey. Check it out on the “Collect” tab of your survey. We’ve given the survey builder a bit of a facelift. You should now find it more organised and easier to do drag/drop re-ordering. Easily select emojis for your multi choice question options in the survey builder. Capture images from respondents with the image question type. 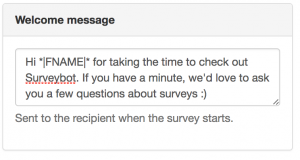 Respondents can send images from messenger and they are captured in Surveybot. We’ve been trying to improve the checkbox question type to make it more intuitive. 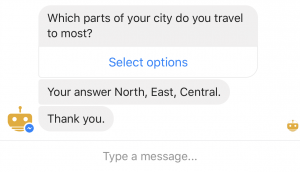 When someone answers a checkbox question the answer is now echoed back to them in messenger. We hope you like these changes! If you have any feedback or other question types you’d like us to add please get in touch via email support@surveybot.io.